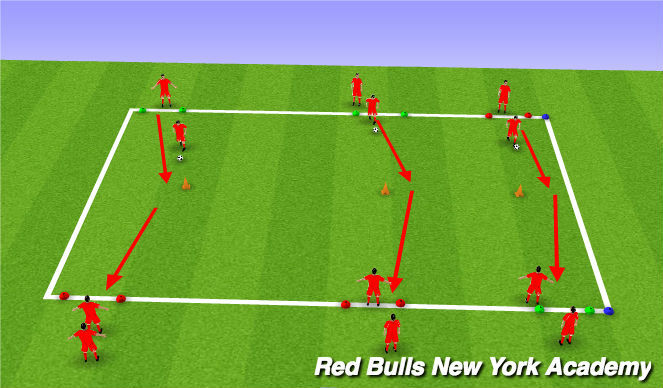 - Players objective, to dribble through as many triangles as they can in 60 seconds. - Players must leave triangle through a different side of the triangle(Example: I dribble through side A, I must leave through side B or C of triangle. - 3 large cones as the halfway marker at an angle in middle of 2 end gates. - Play dribbles at angle to the cone, then passes to the other line. After the pass, the player casually walks towards the player and the attacker must perform scissor move around the approaching defender. Defender can&apos;t steal the ball. Player 2 does the same thing as he heads to the the other side. 1 player goes at a time. 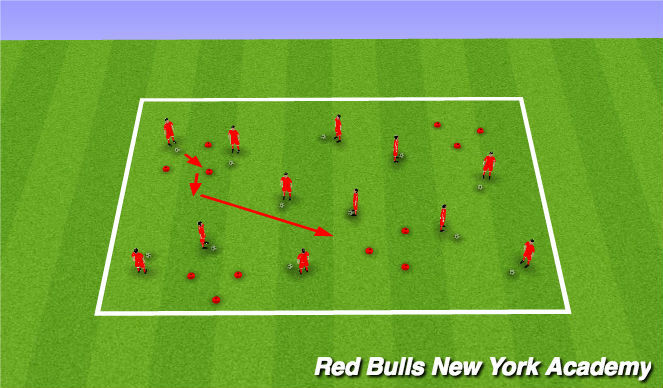 Coaching Points: Larger touches ;then smaller touches as you approach the semi- opposed defender. Accurate pass to teammate. Sell the scissors (fake one direction, push away with the other foot). Attempt the scissors with both feet.